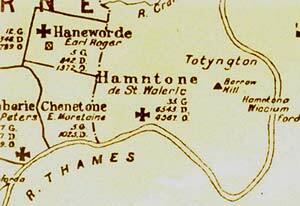 The small settlement that we now call Hampton grew up on a fertile plain of gravel and sand on a bend in the River Thames.The name ‘Hampton’ probably comes from the two Anglo-Saxon words: “Hamm” meaning a large bend in the river”and “Tonne” meaning a settlement. The first written evidence of the village is in the Domesday Book of 1086, but given the fertile nature of the soil there’s no reason to believe that the land was not settled and farmed long before the Normans arrived – when the Catavullani tribe inhabited the area. After the Norman Conquest of 1066 the country was divided by William the Conqueror into ‘Manors’ and the Manor of ‘Hamntone’ was given to Sir Walter de Valery. It was owned by his family until 1217. The original village was probably where Hampton Court now stands but was moved a mile up river when Sir Walter arrived. In 1086 the Domesday Book shows that the total population of Hampton plus nearby Teddington to be only around 200. Hampton’s population did not grow significantly for many centuries – around 300 in 1500, 600 in 1600 (decimated by the plague in 1603), 1200 in 1700, 2500 in 1800, 9400 in 1900, 30,000 in 1950 and around 34000 today. To return to earlier times: between 1237 and 1514 the Manor of Hampton was leased to the Knights Hospitallers of St John of Jerusalem (from whom the present day St John Ambulance is descended). 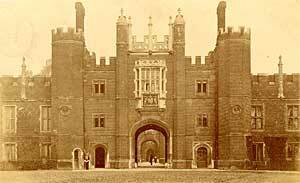 In 1514 Cardinal Wolsey, Lord Chancellor to King Henry VIII, purchased the lease and began to build the Palace of Hampton Court, probably on the site of a large farmhouse that had belonged to the Knights Hospitallers. By 1529 Henry had ‘acquired’ the Manor of Hampton and Hampton Court from Wolsey – and the Palace grew and altered in his reign and those of his royal successors, until the red brick and white stone building that we know today was opened to the public by Queen Victoria in 1838. The village (or Town as locals preferred to call it) grew up not around the Palace but around the parish church of St Mary’s. 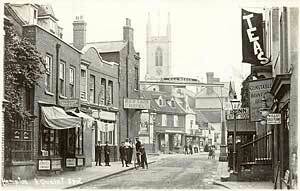 The vicars of St Mary’s can be traced back to 1342, but there was almost certainly a church on the site before then. The triangle of roads that surround the church, now known as Thames St., Church St., and High St., will have been familiar to residents of Hampton for hundreds of years as will many of the field paths and trackways that can still be traced today in some of our modern streets. By the end of the seventeenth century there were signs that Hampton was becoming, like Twickenham, a fashionable place to live, with composer John Blow at Beveree in the High St by 1691 and singer John Beard at Rosehill (now the public library) soon after. In 1754 Hampton’s most famous resident, actor/manager David Garrick, arrived at Hampton House (now Garrick’s Villa) on the riverside. The nineteenth and early twentieth centuries saw great changes in Hampton – the Waterworks in 1855, the Railway in 1864, the trams and the wider roads that were needed in 1903. Farms turned into market gardens and housing spread across the fields of the parish. In earlier days the ‘government’ of the parish was in the hands of the Vestry. Hampton Wick replaced the powers of the Vestry with a Local Board in 1865 and Hampton did the same, to much opposition, in 1890. In 1895 the Local Boards became an Urban District Council. The UDC remained responsible for local affairs until it was absorbed by the Borough of Twickenham in 1937 and the London Borough of Richmond upon Thames in 1965. The lonely village at the bend in the river had at last become a suburb of Greater London.